Whilst working on a rustic project for a recent workshop I decided it needed a finishing touch. And I had just the thing in mind - barbed wire! Not exactly the safest thing to put on a card front you might be thinking - surely it would be too sharp and dangerous. Well, read on to see what I did. Cut two lengths of beading cord, 10cm and 15cm. Set aside the 10cm length. Coat the 15cm length with a thin layer of glue (hint: use your fingers to coat it - they make the best paintbrush!). Stretch the cord between your fore fingers and thumbs and then twist it tightly by turning one hand towards yourself and the other hand away. Keep twisting until it begins to twist back onto itself. Twist a little bit more. The glue will stop it from untwisting. Set this piece aside. Cut the 10cm length in half. Set one piece aside and coat the other piece with a thin layer of adhesive. Wrap it once around one end of the twisted cord to create a barb. Repeat with the second length of cord wrapping it around the other end of the twisted cord. Trim all cut ends at a sharp angle so that the barbs look sharp. Use your finger (remember, they are great brushes! 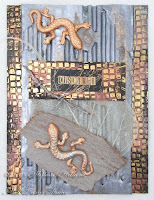 ), randomly paint on Lumiere paint to create the rusty, weathered look associated with barbed wire. And there you have it - ultra light weight, no sharp points in sight and absolutely no rust to tranfer to your project. Pretty realistic looking isn't it? ....and here's the finished sample. Click on the image for a closer view of the barbed wire. What a creative way to imitate barbed wire, safely! Thanks for sharing this great technique. Will we get to see your completed project in the future? Glad you like it Di! Open it in a new window for a more detailed look at the wire.